My art focuses on unraveling the complexity and mystery of human emotions, behavior, and relationships, featuring the individual within or outside of a group dynamic. Layers of color, shape, and calligraphic line palpitate with calm or charged energy to convey a mood: intimacy, loneliness, alienation, joy, solidarity, sensuality, conflict, harmony, or mystery. Depending on the story, I zoom in on an individual, defining their character in layers, or I depict them only as silhouettes or after-thoughts. Are they center stage or out of focus? Do they wear a mask? Each painting is wrenched from personal experience, influenced by dreams, and infused with emotion. Each tells its own unique story and is part of an evolving thread or series. We are all products of our personal histories and in my work, I try to connect the present with the timeless voices and ancestral whispers of my past. I love the physicality of painting and creating. 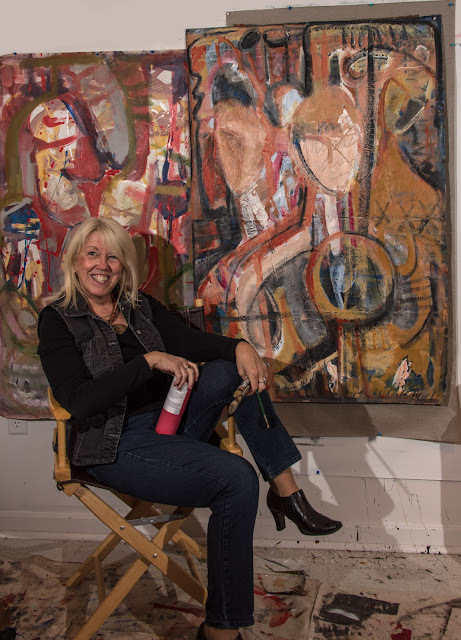 I am an action painter and firmly believe that “Art is an Action Word.” Entering my studio, I turn on the music and tune into my intuition and emotions. I continually move around my paintings in a painting-specific improvisational dance and that energy serves as the undercarriage of my work. I often have up to ten paintings in various stages of progress. Sometimes I work from sketches, but generally I go into the studio armed only with my idea, a memory, and a mood. As I tune out the world and lose myself in the creative process, I splash, pour, draw, and sculpt with paint and plaster, layering to create the undertones and undercurrents of a particular scenario or dynamic. "Everything is connected. Art is an action word." 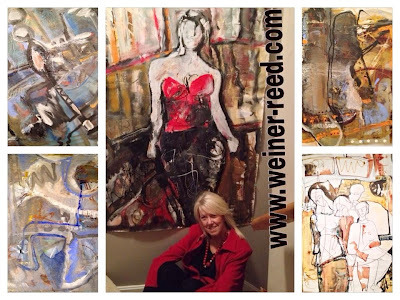 Elaine Weiner-Reed is a bilingual, multidisciplinary Artist living and working in Maryland since 1980. She received an M.A. in French from Middlebury University, VT, and both a B.A and B.S. in French from West Chester University, PA. One of her sub-disciplines was Sculpture. Her work has been included in international shows in China, Hong Kong, India, Spain, Poland, Canada, and at least 20 national exhibits throughout the U.S. Her art is in public and private collections in Poland, France, Bulgaria, Spain, Senegal, Mali, and the U.S. She was one of five American artists in the first U.S. contingent to be personally invited to participate in the 17th annual Poland Ministry of Culture- and EU-sponsored Artist Residency Program (Warsztaty Artystyczne– Towarzystwo, 17th WMA,) and she received an open, standing annual invitation. Her art has been reviewed or featured in The Dobra Polska Szkola, Studio&Gallery Magazine, The Pittsburgh Tribune-Review, The Washington Post, The Baltimore Sun, The Capital Gazette, Attractions Magazine, The Columbia Flyer, The Alexandria Port Gazette, Spain’s feest.es, and France’s paperblog.fr. Weiner-Reed uses line, color, and composition to create iconic or allegorical reflections of relationship complexities, dimensions, and inter-dependencies to resurrect feelings of transcendence, mystery, and hope.